So I made it to Cask Night with my brother-in-law and two friends. It was a great time! The beer offered was indeed from Alley Kat. It was a unique variant of their seasonal coffee porter. Strangely enough – it was extremely similar to the Mill St Coffee Porter I reviewed on the site a few days ago. I took a picture with my crappy phone as I didn’t think to bring an actual camera. Oh well. As you can see we got our fair share. I had 3 pints. 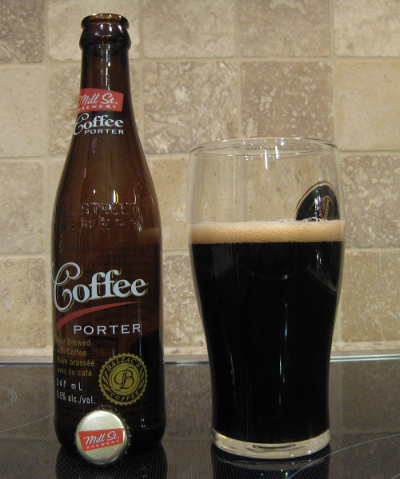 The main difference from the usual coffee porter was the use of premium coffee beans supplied by a local coffee shop – Java Jive. The beans were of higher quality than usual and were vanilla beans. 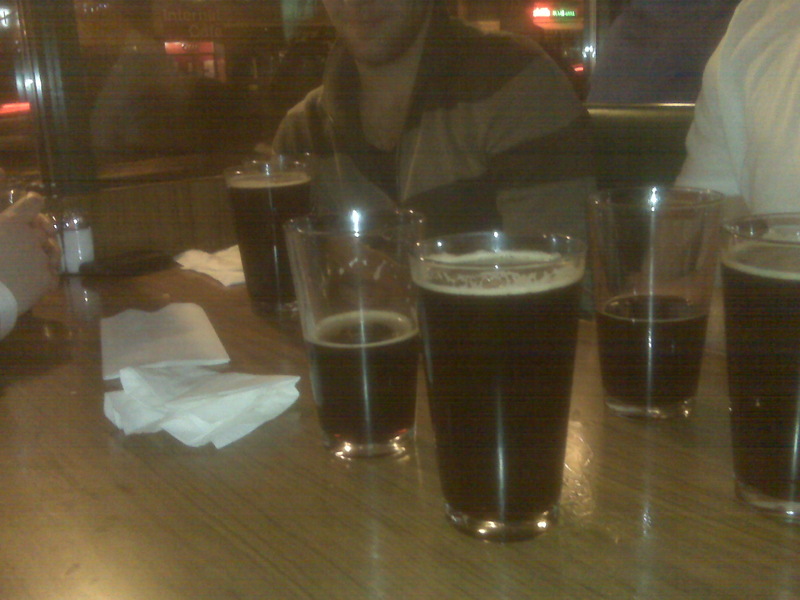 The beer has very similar tasting notes with a very strong coffee flavor and hints of vanilla. It was an awesome beer and I am happy I had the chance to try it before it was gone in less than an hour. Pours a deep black through which almost nothing is visible even when held up to the light. The head developed rather short and thin with little retention. By the time I could even snap a picture the head was already disappearing. The head is a light tan color. The aroma of this beer is exciting as you smell two things immediately: roasted malt and coffee. First the burnt malts dominate the smell and then give way to coffee. It smells very similar to immediately after I grind my coffee beans. To someone who loves both beer and coffee this aroma tempts me (like no other beer has) to make it a permanent addition to my personal breakfast menu. I immediately worry that the taste won’t deliver on the promise the aroma has made. The mouthfeel is surprisingly bubbly for a porter. The initial notes in the taste are of very roasted dark malts with a hint of syrup. I find the coffee is overpowered initially. The aftertaste is definitely of coffee. It is delicious and lingers very long. You can tell quality coffee was used in this beer. The coffee taste is of better quality than you find in certain $4 cups of coffee. It may even make you wonder which beverage you drank. There is a bitterness in the taste throughout the initial taste lasting quite a while after you swallow. There is not a great deal of complexity to the taste. About two or three dominant and complimentary tastes done very well. I think this beer is amazing for the price. It is certainly going to be found in my fridge often.